Kate Cleghorn's "Traveling the Trace"
The Vermont Center for Photography announces a new exhibit, opening on Friday, November 2, during Brattleboro's Gallery Walk. Traveling the Trace: Nashville to Natchez, a collection of images taken along the Natchez Trace -- the historic trail running hundreds of miles through three Southern states -- is the work of award-winning photographer and Putney, Vermont, resident Kate Cleghorn. Last March, Kate and her husband packed up the car and headed south on a photographic quest. Why the Trace? Kate explains, "It's important historically and to me personally. Forays into the southern landscape are the most vivid memories from my own childhood." She continues, "When I was small, my family would pile into the car and head out of Montgomery, Alabama, into the country. We would drive beyond the outskirts of the city, onto the dirt roads, looking for wild muscadines and scuppernongs (grape varieties) and live oaks with Spanish moss. Those trips are some of my favorite memories and strongly influenced my love of landscape photography." For two weeks, Kate and her husband traveled the Natchez Trace Parkway, which parallels the original trail. The journey was one of renewal and discovery for Kate, as she searched out the familiar views of her childhood and new ones, as well. Reflecting on the route's history and photogenic beauty, she says, "Because many people have never heard of the Trace, I wanted to share it through my photographs." Her exhibit does just that, conveying the adventure, hope, and danger experienced by those traveling the primitive road. 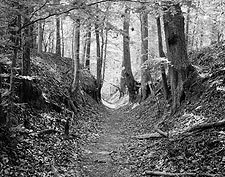 Kate's arresting black-and-white images include photographs of the trail itself, deeply eroded; cypress swamps, surely fearsome obstacles; dogwood blossoms in full springtime bloom; "stands" for the Trace's weary travelers, including an inn where famed wilderness explorer Meriwether Lewis met a violent, mysterious death; Indian burial mounds; battle sites; antebellum home ruins; and stretches of the Tennessee and Mississippi Rivers, at once placid and a bit menacing. The Trace (French for trail) runs 444 miles from Natchez, Mississippi, through northern Alabama to Nashville, Tennessee. The trail likely began as a wildlife travel corridor, and Native Americans, principally the Chickasaw and Choctaw, used it regularly. It appeared on old British maps as the Choctaw Trail up to Tupelo and was then referred to as the Chickasaw Trail. Boatmen from the Ohio River Valley, traveling south by flatboats on the Mississippi River to sell goods in the ports of New Orleans and Natchez, discovered the trail and used it to return north. As travel increased, inns or "stands" were built along the route. In 1801, the U.S. Government cleared and widened the road for the development of a postal system, and it was then that it acquired the name the Natchez Trace. The route continued to be dangerous -- beset by gangs of bandits, alligators, snakes, deep mud, and thick swarms of mosquitoes -- but early Americans relied on it for trade and travel to new lands. 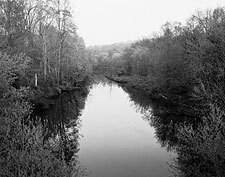 The military also made frequent use of the Trace; for example, in 1814 the Tennessee Volunteers marched south on the trail to defend against the British attack in the Battle of New Orleans. With the advent of steamboats, however, the Trace began to fall into obscurity. In 1830 it was officially abandoned and began to grow back into wilderness. But in 1936 the trail was incorporated into the National Park System, and the government started a parallel road in Nashville. Called the Natchez Trace Parkway, the highway was finally finished in Natchez in 2005. Discussing the process of putting this exhibit together, Kate notes that she did shoot color photographs along the Trace but made a deliberate decision not to use them. She explains, "I think certain subject matter works better for black and white." 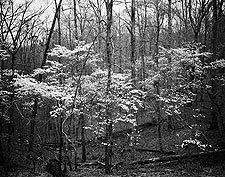 And looking at the images, one understands the artist's choice: the stark simplicity of black and white draws viewers back in time and allows them to contemplate what those early Natchez Trace travelers experienced. Kate has practical and personal reasons, as well. She notes, "I also have always shot more black and white because I have a darkroom at home. Really, asking me why I shoot black and white is like asking me why I shoot film: I'm a dinosaur!" While Kate holds onto much of the traditional photographic process, this exhibit does include one technological advance, and it's a first for the artist. Kate notes, "This will be the first show in which I have put up pigmented ink prints, not gelatin silver prints." Kate explains that the gelatin silver prints are the traditional black-and-white prints, made from light-sensitive fiber paper that is immersed in a 3-bath set of chemicals: developer, stop, and fix. In a pigmented ink print, water-color paper is used, and the image is laid down by ink from nozzles in a printer driven by a computer. Not surprisingly, this process has generated controversy. Explains Kate, "The big debate about these types of prints was were they archival? Gelatin silver prints are." She goes on, "Now, using a certain type of pigment, the inks are considered archival, too." After a six-year stint at the School for International Training in Brattleboro, Kate Cleghorn went off to law school in 1986. After graduating, she practiced law with Vermont Legal Aid. Some time later, she decided to return to school, this time to pursue her passion for photography. Kate received an MFA from the Savannah College of Art and Design. She has also studied at the Maine Photographic Workshops; The George Eastman House in Rochester, New York; the Center for Photography in Woodstock, Vermont; Photographers' Formulary in Swan Valley, Montana; and Zone VI Studio in Vermont. Kate shares her knowledge with students in Vermont and elsewhere. She has taught photography for the Community College of Vermont; Johnson State College in Johnson, Vermont; and the Vermont Center for Photography in Brattleboro, Vermont. She assisted Geoff Winningham's Other Americas photography program in Oaxaca, Mexico, for three summers; led the Great River Arts Institute's Day of the Dead program in Patzcuaro, Mexico; and also led the Community College of Vermont's Arts Appreciation program in Puebla, Mexico. In addition to photography classes, Kate teaches copyright workshops to artists. Lynn Barrett is president of Primetime Concepts, Inc., a public relations firm in Dummerston Center, Vermont.